All quotes, unless otherwise noted, are taken from Daniel Kikawa's excellent book, Perpetuated in Righteousness. The language of the Polynesian peoples is basically one language, the missionary translators who first assigned a written spelling for the different island groups, heard the words differently and represented these sounds that they heard with different letters. For instance the Hawaiian word for 'woman' is wahine (vah-hee-nee), the Tongan word for 'woman' is fahine (fah-hee-nee). Much like the differences between American English and British English - there is understanding but differences in accents and idioms. So, the oral traditions of the Polynesian peoples, with minor differences, give a remarkably similar account of their history and beliefs. There are Polynesians today, who can recite their lineage back to one common ancestor. Here are some excerpts from those accounts. Note that these predate the coming of the missionaries and were not influenced by Biblical record. These legends include stories from Hawaii, Tahiti, Samoa, Tonga, Marquesa and the Maori of New Zealand.
" 'Io dwelt within the breathing space of immensity. The universe was in darkness; with water everywhere, there was no glimmer of dawn, no clearness, no light. And He began by saying these words, that He might cease from being inactive, 'Darkness, become a light possessing darkness.' And at once light appeared." " 'Io then looked to the waters which compassed Him about and spake a forth time, saying, 'ye Waters of Taikama, be ye separate. Heaven be formed.' Then the sky became suspended. 'Bring forth thou Tupuhoronuku.' And at once the moving earth lay stretched abroad. " 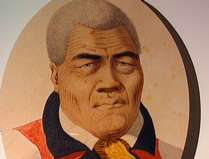 "Fornander (leading foreign source of Hawaiian history) said, "... I learned that the ancient Hawaiians at one time worshipped one god, comprised of three beings, and respectively called Kane, Ku and Lono, equal in nature, but distinctive in attributes..." p 54 This Polynesian god had many titles, but one name, too holy to be mentioned in casual conversation and this name was 'Io. Also, the Hawaiians consider the day to begin with the setting of the sun. The first group of Proto-polynesians probably left the middle east around BC 2300, about the time of the tower of Babel heading toward Sumatra. The second leaving around 1400 BC, going to India' with the first group making it to Fiji a hundred years later (1300 BC). The Marquesans first settled in 100 AD and the Marquesans reaching Hawaii, the most geographically remote archipelago in the world, around 400 AD. The Maori landing in New Zealand in 700 AD and the Tahitians beginning to arrive in Hawaii between 1100-1200 AD. The conquering war chief, Pa'ao from Tahiti around 1300 AD. In the period of 100 years, 1300-1400 AD, an unknown number of warlike Tahitians arrived on the peaceful islands of Hawaii. At some point the warrior / priest Pa`ao came to Hawaii and found that the religion (that of the Tahitians) was at a 'low ebb'. He was disturbed that the people lived in peace and that the "...kapus were few and the ceremonies were easy: that human sacrifices were not practiced, and cannibalism was unknown; and that the government was more patriarchal than regal in nature." (Fornander, An Account of the Polynesian Race, Vol.1,p 209) To him, it seemed that the previous invasions from Tahiti, had failed. There being no real class distinctions and the newcomers being assimilated into the culture was with typical Hawaiian Aloha. This could not be tolerated. He went back to Tahiti and then returned with warriors, priests (kahuna) and royalty (ali'i) of much mana (spiritual power). With this force, he invaded the peaceful land. He killed the priests of 'Io and changed the attributes of Ku, Lono and Kane, from detesting human death, to demanding it. He brought bloody stones from a human sacrificial site in Tahiti and used them to desecrate the primary heiau (temple) of 'Io on the "Big Island" and then built his luakini (human sacrificial) heiau on top of it. A few of the priests of 'Io escaped to New Zealand, before Pa'ao had the great voyaging canoes burnt, his own included. I don't know if the great Hawaiian navigators were put to death with the destruction of their vessels, or their escape so infuriated the invader that he burnt the remaining canoes as retaliation, but Hawaii had very little contact with the outside world for the next 100 years. Pa`ao is credited with, not only the destruction of the peaceful culture of the Hawaiians and the perversion of the worship of Ku, but with the introduction of many elemental spirits (like Pele - one chant mentions 400,000 lesser 'gods'), but also of the cruel 'kapu' system. This forbid many things and demanded many more, with any infraction being punishable by death. The laws were strict and always favored the kahuna and the ali`i. At some point during the eradication of the priests of 'Io, one of them prophesied that 'one day the knowledge of 'Io would be restored to the Hawaiian people.' For 600 years the families descended from the priesthood have kept that hope alive, wondering, will our son be the one? Kamehameha born in the Kohala district of the "Big Island" around 1753. Before his birth a kahuna prophesied that the baby would grow to be a "killer of chiefs", so even before his birth there were already those who were out to kill him. Because of this prophecy he was not raised at home but back in the mountains by trusted servants. Kamehameha means the "lonely one". 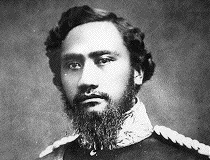 He received warrior training from his uncle Kalaniopuu a chief over northern Hawaii and eastern Maui (Hana). It was in a battle with the ruler of western Maui , which they lost, that the young Kamehameha won the reputation as a ferocious warrior. Also during this period that he became the keeper of the family god - Kukailimoku "ku of the bloody mouth, ku the destroyer." When Kamehameha was 37 aided by two "haole chiefs"(Isaac Davis and John Young along with captured cannon from the ship "The Fair American"invaded Maui and subdued it. This was the first use of cannon in Hawaiian warfare. The final battle, called Kapaniwai (the damming of the waters, so many were slaughtered that the stream was dammed with the bodies), was fought in the `Iao valley, just west of Wailuku. Upon returning to the Big Island, he found that many more battles awaited him but had a dream, that if he'd erect a new heiau to ku, he would be able to conquer and unite the islands. Upon it's completion, his enemies came to it's dedication where they were slain and offered as sacrifices. By the time he was 43 (1796), he had unified the islands having defeated all the rest except the King of Kauai, Kaumuali, who simply recognized Kamehameha's authority and superior strength. It is said that he was as gentle in victory as he was ferocious in battle, some have called his rule the golden age of Hawaii. 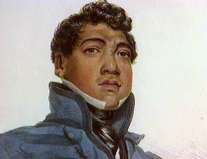 Hawaii was at peace for the next 20 years until his death, May 8, 1819. Towards the end of his life a new heiau was built and human sacrifices were required but he said that human life was now sacred to the king. This was the first break with the cruel gods of Pa`ao and the bloodthirsty kapu system. Born 1792, on the Big Island, during Kamehameha's wars of unification and orphaned by them as well. Trained by an uncle to be a kahuna at the luakini heiau by Kealakekua Bay. Befriended by a ship's captain and taken to Boston where he attended Yale. There he learned Hebrew and Greek and started to translate the Bible into Hawaiian from the original languages. He noted how similar Hebrew was to Hawaiian. Was about to return to Hawaii when he became ill with typhus fever and died. The story goes that at his funeral people volunteered to take his place and this became the basis for the first mission board to the Sandwich (Hawaiian) Islands. His scholarship (he earned the equivalent of a Ph.D.) showed the Americans that the "heathen" could be educated, and therefore converted. In the early 1990's Henry Opukaha`ia's remains were returned to his beloved Hawaii (the Big Island) and were interred at a site overlooking Kealakekua Bay. Hewahewa, a high ali`i himself, and the highest of the (religious) kahuna in the Kingdom of Hawaii under Kamehameha I. He was a direct descendant of Pa`ao. Shortly after the death of Hawaii's first king, the leadership of the Islands fell into the hands of the "feisty" Ka`ahumanu, the 3rd of Kamehameha's wives and the independent minded "love of his life". She was the kahuina nui, the queen regent and although childless herself, ruled, along with Keopuolani and her son Liholiho, until he was old enough and was qualified to rule. Keopuolani, Kamehameha's first wife, had much more mana, that elusive power that separated the "ali`i"- royalty, from the "kanaka maoli" - the common people. She was so supremely royal that the King himself had to strip naked and crawl on his stomach whenever he wished to approach her. These three, along with Hewahewa, ruled Hawaii after the death of the king, and they saw the kapu system was grievous to the people, made great demands on them, often costing their lives for a simple mistake or small infraction. They also saw that with the foreigners, who were more frequently coming to their shores, that these rules were not observed and the world did not come crashing down.The stage was set for change. Hewahewa then retired to a place to await the coming of 'a new and better God'. When he spotted the Thaddeus approaching, the ship carrying the missionaries, he went down to greet them and introduce them to the king, as the representatives of the God he was expecting. He was quoted as saying,"I knew the wooden images of deities, carved by our own hands, could not supply our wants, but worshipped them because it was the custom of our fathers...My thought has always been there was only one great God, dwelling in the heavens." The kapu was broken by the Hawaiians alone, 6 months before the arrival of the missionaries. 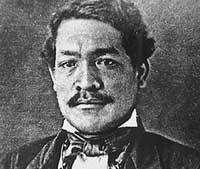 Not a whole lot has been said about Hewahewa, but what has been said shows a man who was genuinely hungry to know God, not to have religious power, - he had that, he was born an ali`i, a direct descendant of the powerful Pa`ao and the chief kahuna under Hawaii's most powerful king, if any man had a reason to maintain the status quo, it was he. Other quotes of kuhuna show that the knowledge of `Io still existed in their training but, until Hewahewa, kept this incredible secret of the benevolent God of aloha, who held the lives of men sacred, from the people in fear. Praise the living God for Hewahewa and his personal courage. It is no wonder, that, when the character of the God of the missionaries be came known, and the great similarity the nature of `Io, He became accepted with such great alaracty by the Hawaiians. Much maligned group of individuals who gave their lives for their beliefs. The original group, believed that Kamehameha 1 was still King, when they left, that the unification wars were still going on, and that they would get a most unfriendly reception. They were the first American foreign missionaries. They signed a contract that did not allow them '...to participate in government, commerce or even own land'. All materials were held in common, for the good of the Mission. The one missionary family that broke that contract, was sent home and (he) died within two years of returning, a broken man. These missionaries, returned home having completed their task. I wish I could say the same for others who came later with other purposes in mind. I believe, that those who'd planned to usurp the Kingdom, used the name, the "Missionary Party", because those selfless individuals who came to do good, had a reputation of doing no wrong. The Hawaiians trusted the title missionary. It is regrettable that such wrong was done in their good names. Nothing is ever simple, especially when human beings are concerned, it would be easy (and politically correct) to say that the "whites" or the "missionaries" or the "Americans" or the "sugar planters" or the "rich" or the .... etc., etc. ... were to blame. Actually, everybody had a hand in it. God is not the God of hypothetical cases. He does not deal in "What if?" When you know all and see all, you deal with what is. Fact: Hawaii's rulers had committed their nation to the sovereign God. Fact: The missionaries introduced new ways, some were scripture and some were only culture. 'That was the way we were taught to dress, worship, do it, so that's the way we'll teach others to do fill in the blank ' Problem is, if you teach the traditions of men as if they were the commandments of God, people will always suffer. Of course, the missionaries had been taught the same way and knew no better. Follow the " Time-Line " for a step by step of the overthrow, (missing from that, I notice, was the McKinley tariff act, circa 1892, where the US levied a tariff on Hawaiian sugar as being not an American product, thus cutting off the planters from their most profitable market). 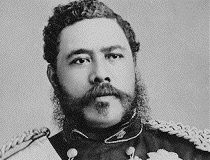 But also part of this mix is the fact Queen Liliuokalani's brother, King Kalakaua, aka "The Merry Monarch", lived life to lavish excess, often referring to himself as the "King of the Pacific" and encouraged the Hawaiians to return to the "old ways" (Pa`ao - the invader, from Tahiti, not `Io- the God of Hawaii, from their earliest oral history ) saying, "The old gods of Hawaii are good enough for us." [ Hazard, The Dolphin Guide to Hawaii, pg.93 ] It would appear that in scorning the God who gave him power, indeed life, he also brought about judgment on his kingdom, Not for me to say. Those sons of the missionaries who traded the God of their fathers for the gods of this world, will have much to answer for on That Day. They certainly brought reproach on the God of their fathers. Hawaii seemed to go from Christian to pagan over night. So wounded were the Hawaiians in the betrayal of the trust they had put in the missionaries and their descendants. 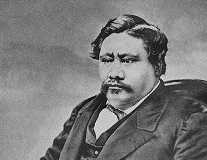 Queen Liliuokalani, writing to President Cleveland reminded him of the sin of Ahab in wrongfully seizing a piece of land from a man more righteous than himself and the consequences of that action on Ahab and his kingdom, she then prophesied that this would happen to America "... in the days of your children's children. " About now. A personal note : I admit, after living here in the island for 13 out of the last twenty years, my sympathies are with the people of this land, but my loyalty is first and foremost with the Lord Jesus Christ. If my account of what has transpired does not line up with your understanding, do the research, look it up. Be aware that my intention is not to stir up trouble, bitterness or hard feelings, they exist, but to call the people of God to Pray For Hawaii [ pray4hawaii ]. All over the world a spirit on national pride is being inflamed to a bloodthirsty passion;- Bosnia, Kosovo, the Kurds, Tootsi and Hooto, etc. This same unholy spirit is at work in the islands. But God is also at work:- Re 5:9 "And they sung a new song, saying, Thou art worthy to take the book, and to open the seals thereof: for thou wast slain, and hast redeemed us to God by thy blood out of every kindred, and tongue, and people, and nation;" Re 14:6 And I saw another angel fly in the midst of heaven, having the everlasting gospel to preach unto them that dwell on the earth, and to every nation, and kindred, and tongue, and people," He wants representatives from every tribe, tongue, kindred and nation. We may be one in our loyalty to Him but were are to worship Him out of our cultural diversity. I believe, it is God's desire to be worshipped with the culture He created us into. Pray for the peaceful restoration of the Nation of Hawaii and it's people, pray that it will be with a return to it's Godly heritage, it can happen, there were a 1000 prayer meeting per noon hour in Manila when Marcos' tyranny was toppled in a 'bloodless coup'. The UN has determined that the nations that have been colonized shall be returned to their rightful owners by the year 2000. Something has got to give. Pray that it will be in revival and not revolution. 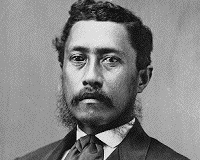 In 1993 President Bill Clinton and the U.S. Congress signed Public Law 103-150 where the Government of the United States of America formally apologized to the Hawaiian People for falsely imprisoning their Queen and conquering the nation of Hawaii, They did not, in any way, promise the restoration of the Sovereign Nation of Hawaii or reparations for the 100 years of occupation. In 1998 Majesty Akahi Nui was coronated King of Hawaii. February 22nd. He is a direct descendant of Queen Liliuokalani's sister and has been traveling on a Kingdom of Hawaii passport ever since. He has been recognized by the United Nations as the representative of the Hawaiian People and the other sovereignty groups have been advised that if they have a appeal to bring up to the World Court they must bring it through Him. Already He has renewed treaties with nations who had treaties with the Kingdom of Hawaii (except for the United States). Pray that He be surrounded with wise and righteous counselors, that He be protected from foolish choices and that he will be able to keep the hotheads in line, who want to take the law into their own hands. Pray that the grace of God be upon Him in order that He may accomplish the task that is before Him. Pray also for peace in Hawaii, as it often is with the young, there are those who want all the changes now. The United Nations has committed to freeing all the peoples who have lost there homelands due to colonization in the year 2000. (This announcement was made by the UN representative to the King's coronation, but, it would seem, that the incident in E.Timor has slowed down this independence project.) How this will all shake out remains to be seen, but pray that the transference of power be smooth and peaceful. If you want to contact him with words of encouragement and if they are encouraging I'll see if I can pass them along. This is not meant as a sounding board for the various sovereignty groups or even written with Akahi Nui's permission, although I intend to show him when this gets online, but only one man's view of what has happened and what need's to be done. I don't want to stop the Hawaiians from regaining there land, I just want to see it done peacefully, if they gain back their land but lose their Aloha, they exchange one tyranny for another. According to the 1852 Constitution the Premier assumes the role of Monarch upon the death of the King. 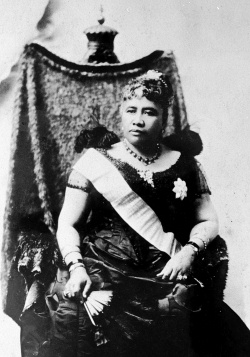 On the day of King Kamehameha IV's death, Her Highness Premier Ka'ahumanu III, in Privy Council, proclaimed her brother as successor to the Throne. 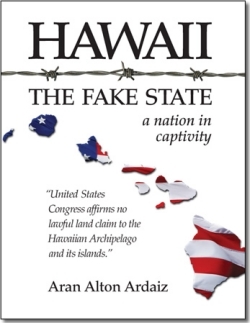 The book comes from an evaluation of findings after more than twenty eight years of political review and lawful study; investigation and determining facts of law; and, of actual events and of unlawful actions by the Federal United States Government; its deceptive and fraudulent claim over a foreign, sovereign and "neutral" nation; actual evidence of misleading legal documents of false claim for a Statehood in the American Union of States that does not lawfully exist and that can never exist. It is a revelation of past historical events with supporting documentation revealing to a new generation of Americans and Hawaiian Citizens on how they have lost their birth names and birthrights, as well as their Citizenship as "Private Citizens" within their respective nations. How they have been deviously removed from their birth State's Constitutions and "State's common-law" and their National Constitutions (of the American Republic of States and of the Hawaiian Kingdom) to a lesser Washington D. C. "Federal Emancipated Slave citizenship" (14th Amendment) under Article 1 Section 8 of that very same Constitution of the American Republic and its Union of States.